Today is my blog’s 1 year anniversary. I started this blog as a class assignment for a masters course in Social Media. I went against advice to have a single topic blog because I wanted one place to document my interests. I hoped that others would be interested in what I wanted to show. My blog has many focuses but this year embroidery and bento’s are important themes. So I decided to giveaway two items. Bento: Large Lunch box Bento 2 tiered plastic lunch box set with 4 removable inner pieces. It is pink as pictured above. Please indicate in the comments which item you would like to win (embroidery or bento). International entries are welcome. Please make sure that I have your email address so I can notify you if you win. One entry per email address. Of course I would like more followers but personally I often don’t enter contests if there is a requirement to follow a blog or like in Facebook. If you want to become a follower of my blog I will be happy. But if you don’t, that is fine also. The contest will end on Wednesday July 25 at 8 am EDT. Probably no surprise I would love that pink bento box if my comment was selected. Although your embroidery is very impressive! As are your bentos. Congratulations on a successful year doing both! Happy Anniversary I would love the Bento Box. How fun a way to celebrate a year of blogging! I would love the embroidered napkins! Or does that mean I have to embroider them or you do??? I would love the bento box! Great give away! Thank you! Welcome to the bbf group! Happy Blogoversary! I would love the napkins to embroider. Thanks for the giveaway! Happy Blogoversary! I’d like to win the bento box. Although I’d use it to organize my embroidery floss. Happy Anniversary! I prefer the bento box. Congratulations! I would like to win the bento box. You made it! One year later and still going strong. Please enter me in your anniversary contest. If I win I would like the Martha Stewart napkins. Congrats upon the 1st year anniversary! Interesting contents in your blog yo..Keep it up up UP! Happy Anniversary! I enjoy checking out your posts. I would like the napkins. Thanks. Happy One Year Blogiversary!!! 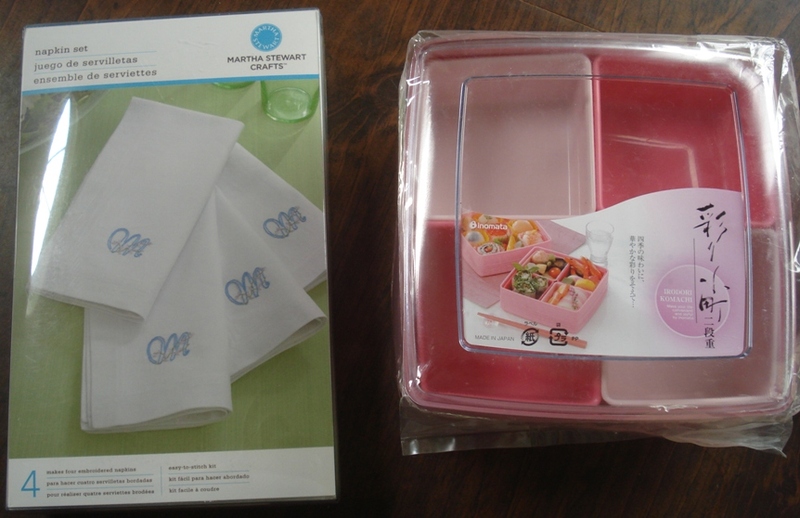 I like the bento box, but the napkins are very impresive too! And I PREFER multi topic blogs! I have friends with multiple 1 topic weblogs and I can’t keep up. I like to see the different sides of a personality. I’d love to win the bento! sounds like a good idea. i would like to try to get the bento. Happy anniversary! I loved your Zebra bento! home at the monent. Currently visiting with my sisters in Oklahoma. Congratulations on your blog’s anniversary. I like the Bento box. Hi! Happy Birthday eclecticlamb! That is a wonderful accomplishment! If I win I would enjoy the lunch box. I do enjoy seeing some of the wonderful creations you come up with! Congratulations on your 1 year anniversary! I like the towels. I would love the napkins. Happy Blogiversary! Many of us started around the same time 🙂 Congrats! If I won, I would choose the pink bento box! Happy one-year anniversary! I would love the bento box. Thanks for the chance to win. Congrats on one year! Although I love Bentos, I would love to win the embroidery kit. Am I too late? I’ve resisted purchasing bento containers because there’s no need/audience in my house, but if I won these I’d go on personal picnics just to have an excuse to pack them with cute food!